Sydney’s introducing a new public transport fare system called “MyZone”, from April. At first I pretty much believed the name and the colourful graphics on the web site, which implied that it’s a Melbourne-like multi-modal zone fare system, working on every train, bus, tram and ferry. Apart from not being integrated across services (just having to change vehicles and wait should be penalty enough, let alone a financial penalty as well), the problem with this system of fare stages is it’s almost impossible to know what you’ll pay in advance. They do have combined zone tickets, but it’s like some kind of Frankenstein creation. The MyMulti tickets look at first glance similar to Melbourne’s zone tickets which are valid on any vehicle, but they’re not. For a start the only daily version covers the whole of greater Sydney, and costs whopping $20 — designed to replace the pretty-much-tourists-only Day Tripper. 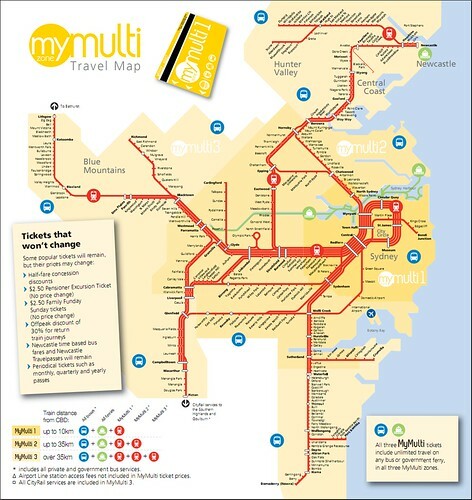 Weekly, Quarterly, Yearly MyMulti tickets look more reasonably priced, and simple, with three zones, but there’s a catch: like the current crop of TravelPass tickets, they’re designed for people travelling to/from Sydney’s CBD and inner suburbs. If you travel say from Katoomba to Blacktown every day, which is entirely within the MyMulti Zone 3, then tough: the only way you can use it is to pay for all three zones. On the upside, these new tickets apply on Sydney’s private bus services, which until now have had their own unique fare structures. On the down side, none of these new tickets will be valid on the Monorail (hardly a surprise) or the Sydney Light Rail (a silly omission). And using the Airport line stations will still incur extra fees. So all in all, it simplifies things, but it’ll still be more complicated than it should be. But we shouldn’t expect too much: they’re going to be using the same ticket machines they already have, so it’s hardly surprising they haven’t been able to completely overhaul the fare system. Given their Smartcard project T-Card failed because of the myriad of different fares, I do wonder if this isn’t the precursor to having another go at it. Good luck to them. If they do go down that path, here’s hoping it doesn’t turn into another T-Card… or another Myki, for that matter. My daily trips from home to work is only 3 stations, but the new changes will reduce my weekly ticket from $29 to $25. And my rare weekend trips to the CBD will reduce by a dollar or so. So I think its good. I see all the school kids back on the trains this morning… damn freeloaders! It definetly looks like a precursor to your style of zoned fares, the current system was seen as the main reason why the tcard failed and zonal is needed before anyone will touch that again. Id give it 12 months operation and then we will be past the next election and they will then give it another bash, ‘they’ being whoever gets in, if its labor then it might happen sooner as you would think they have a plan “maybe?? ?’, if liberal then it will take longer as they would put all options back on the table and take time to do further reviews. either way, they would want to move straight away, gives people 4 years to forget the pain if they stuff it up totally, given the track record (no pun intended) they are bound to do that. What they have done is retained the existing bus-only, or train-only, products in a slightly simplified form, and introduced the new multi-mode zone tickets over the top. These new fares are a fantastic cheap deal for people in the outer suburbs who use feeder buses to the stations, as well as people from places like Kiama and Newcastle ( who are rather few in numbers ). However there is a very substantial price hike for people who mainly use buses in the inner areas, which was supposedly one of the most profitable ( closest to break-even ) parts of the public transport business already. It makes any notion of “user pays” look like a joke. While it hard to compare fares between Melbourne and Sydney, Melbourne’s zone 1 & 2 daily for all transport is nearly half the price. Thank you so much for explaining some of this…we’ve just moved to Sydney from Melbourne and I was thinking it was just me finding the Public Transport System confusing! Thats right, the DayTripper is fantastically expensive. So anyone who needs to use more than one mode of transport, or more than 1 bus each way, is still paying very high fares unless they use a weekly. If they are going to have these three zones, there should be a multi-mode daily available in each zone. For people like john who say distance-based fares and a lack of multi-mode tickets are a cause of failure, I have one word: Tokyo. It has arguably the most successful public transport system in the world. That system is highly fragmented – different railway lines are operated by different companies, and need different tickets; the fares are distance-based. But it works, and it’s easy to use. You can use touch-on/off smartcards in Tokyo (the Suica – with the running penguin logo) – these work on most railway lines, as well as busses – but you don’t feel like your getting screwed if you don’t have one. You get a refund for your ¥500 deposit when you return it, too. Suica can be used for a bunch of other things – some vending machines, arcade games, public lockers, shops and taxis accept it, and some computers can use them for online purchases. You can also get phones with a built-in Suica chip, or cards that are some combination of Suica, credit card and electronic boarding pass. I think just comes down to Australian culture. A half-baked system will be poorly implemented, then wrestled into submission until it kind of works, and at this point, replaced with the next half-baked system. There’s a distinct lack of vision in all these ticketing systems. Does it start on April the 1st ?????? ?